TO REGISTER ONLINE, click on the “Click here to register” link for the class you want. After you have submitted the registration form, you will be taken to the payment page where there will be a “Pay Now” button for our secure payment system through Paypal. You can use any credit card. You do not have to have a Paypal account. Registering and paying online is the fastest way to ensure your spot in the class. If you pay by check, we must receive your payment at least four days before your class starts. Online registration and payment is available until the class fills. TO REGISTER IN PERSON: Registration and payment is available in the Berkeley Art Works gallery during regular hours, Wed 11-5, Thu 11-5, Fri 11-8, Sat 10-4. TO REGISTER BY MAIL: Return form and payment to Berkeley Arts Council, PO Box 984, Martinsburg, WV 25402. Please read our Registration and Refund Policy below. Questions? Email instruction@berkeleyartswv.org or call 304-620-7277. Berkeley Art Works, 116 North Queen Street, Martinsburg, WV. Note: this is not the building on King Street that has another name. :>) Parking is available in city lots on on East and West Burke St. Metered parking 9-5 weekdays. Mixed Media Journal Class is an exciting unique process to create mixed media art. Participants learn how to express themselves by creating dynamic backgrounds to support various drawings, textures, poems, verses, etc. using wet or dry mediums. Materials such as magazine cuts, photos, glitter, coffee filters and more are utilized to compose an overall personal visual statement. The enjoyment comes from unleashing one’s imagination and feelings. Supplies: Mixed media journal with heavy pages; waterproof ink pen in black or choice of color; white gel or acrylic pen (used for writing); choice of acrylic paints, watercolor paint or pencil, markers; small round tip brushes sizes 4 or 6 and 10 or 12; transparent heavy duty glue or gel medium; any color gesso used to waterproof the completed surface. All other materials will be supplied by the instructor. Each week, participants will learn to draw and paint that week’s subject in various ways. Painting trees of all sorts will be shown in ways to make them either realistic or interpretive. Rocks will be demystified and painted to reflect their forms and surfaces through management of shadows and shadings. Textures will be introduced to help enhance the overall look of an art piece and a variety of techniques to produce useful and appropriate backgrounds to support the overall appearance of a painting will be learned. Supplies: Participants should bring all supplies needed to paint in their favorite medium (Watercolor, acrylics, oils, pastels, colored pencils, etc). In addition, pencils, ruler, sketch pad, tracing paper, eraser and notepad are necessary. Instructor will supply all other materials needed. Learn to paint landscapes with that WOW! factor. Working from the same landscape reference photo of your choice each week, instructor will present different approaches to paint the same landscape scene but with vastly different results. This is a unique way to push your own art into new dimensions, all the while learning composition and color theory beyond the usual. You will surprise yourself with your ability to advance your own art expertise. Supplies: Participants should bring all supplies needed to paint in their favorite medium (Watercolor, acrylics, oils, pastels, colored pencils, etc). In addition, pencils, ruler, sketch pad, tracing paper, eraser and notepad are necessary. Discover a new art approach each week ! Have fun with handmade papermaking, experiment with ink drawing and colorful painting, get excited about printmaking, and create awesome tissue paper collage. Plus glitter ! Class activities involve paper, water-soluble paints, tissue papers, glitter. Recommend students wear a big shirt to cover good clothes. 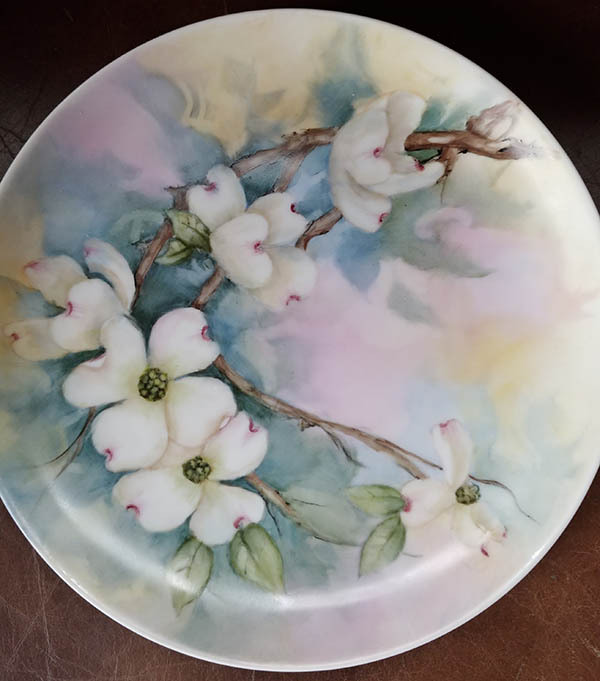 The amazing art of porcelain painting and how to paint the shadows and illusions of a dogwood blossum in spring. How to achieve our shadows and shapes with the layering of these translucent paints. No previous experience with porcelain required. Very fun class. Supplies: Instructor will supply all materials, paints, brushes, and porcelain plate, and the firing of plate after each class. Students may bring paper towels. And painting apron. Class is a comprehensive study of color and all its attributes necessary to producing outstanding 2 dimensional art. Students will learn the following: color theory, rules in using and mixing colors, color wheels, triads and tetrads, color in design, color schemes and much more. Class is comprised of both lectures and hands on exercises and is useful for beginners as well as advanced artists. Supplies: Students may work in any 2 dimensional art medium of choice. A small color wheel is required as well as the materials the student prefers to use to complete various exercises. Also, it is necessary for student to bring pencils, erasers, scissors, and appropriate art paper as well as note paper. All other materials will be provided by instructor. Class information and fees are provided on the BAC website. An online registration form must be completed either by the student or a BAC representative. Tuition may be paid online using a credit card that is processed through the secure PayPal system. Registration may also be paid by cash or check but payment must be received within four days of the start of the class to assure the student a space. BAC reserves the right to take a student off the roster if not paid in advance. Follow this link for a printable registration form. Holiday schedule: Classes will be held on federal or state holidays (President’s Day, election day, etc.) if that is a normally scheduled day. Class will not be held on Memorial Day, July 4, Labor Day, Thanksgiving, or during the last 2 weeks of December. If a class is cancelled by BAC due to insufficient enrollment or another reason, the instructor or Coordinator shall notify the students and arrange for a refund of fees paid. · Withdrawal after first class session: no refund unless there are special circumstances, i.e. a medical or family emergency. A fee of 20% of the original amount will be deducted and the remaining amount is pro-rated by number of classes already held. · Withdrawal less than four days prior to first session: refund of fee paid less 20% service charge. The Berkeley Art Works is the Martinsburg home for a select group of local and regional artists, whose work is on display and for sale in the gallery during our business hours. Meet the Artists at The Works here.